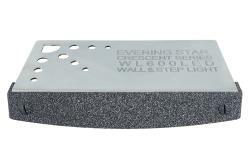 Evening Star® Lighting is one of the first United States manufacturers to patent, develop and produce the flange mounted Hardscape Light. The Crescent™ Series is packed with many features not available with other brands. Precision engineered for Wide Spread Illumination, CREE® High Performance Ceramic LEDs Project light Down and Outward on a 30° Angle, providing illumination on steps, walkways, patios or driveways where it is needed most. An Advanced Optical Lens provides pleasing, Even-Toned disbursement of light with No Hot Spots. 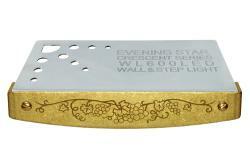 Use to illuminate walls, steps, pillars, outdoor kitchens, BBQ grill islands and more! 4 LED Color Options and 14 Designer Faceplates add long-lasting beauty to any outdoor living area. 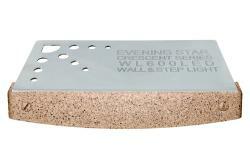 Faceplate finishes match or compliment hardscape materials and natural stone. Proudly made in USA. 6" wide Crescent™ Series Hardscape Lighting Fixture with a Designer Faceplate in Antiqued Copper. 6" wide Crescent™ Series Hardscape Lighting Fixture with a Designer Faceplate in Antiqued Copper and our Exclusive Wine Grapes Debossed Vignette. 6" wide Crescent™ Series Hardscape Lighting Fixture with a Designer Faceplate in Antiqued Brass and our Exclusive Wine Grapes Debossed Vignette. 6" wide Crescent™ Series Hardscape Lighting Fixture with a Designer Faceplate in Antiqued Brass. 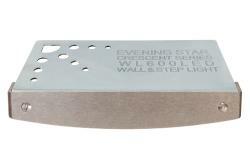 6" wide Crescent™ Series Hardscape Lighting Fixture with a Designer Faceplate in Brushed Stainless Steel. 6" wide Crescent™ Series Hardscape Lighting Fixture with a Designer Faceplate in Desert Stone Faux Finish. 6" wide Crescent™ Series Hardscape Lighting Fixture with a Designer Faceplate in Pewter Faux Finish. 6" wide Crescent™ Series Hardscape Lighting Fixture with a Designer Faceplate in Granite Faux Finish. 6" wide Crescent™ Series Hardscape Lighting Fixture with a Designer Faceplate in Weathered Brown Faux Finish. 6" wide Crescent™ Series Hardscape Lighting Fixture with a Designer Faceplate in Earth Faux Finish. 6" wide Crescent™ Series Hardscape Lighting Fixture with a Designer Faceplate in Java Faux Finish. 6" wide Crescent™ Series Hardscape Lighting Fixture with a Designer Faceplate in Rust Faux Finish. 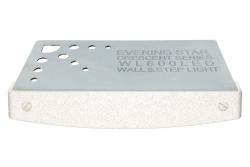 6" wide Crescent™ Series Hardscape Lighting Fixture with a Designer Faceplate in Stucco Faux Finish. 6" wide Crescent™ Series Hardscape Lighting Fixture with a Designer Faceplate in Black Iron Faux Finish.